Loretta Lynn Releasing New Album! April 13, 2017	Britni Blog, DK Blog, Geoff Blog, Jim Blog, Jon Blog, Kirby Blog, Neil Blog, What's Happening in BOB Country? The queen of country music is blessing us once again with a new album, set to drop August 18th of this year! 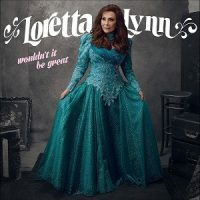 It’s called “Wouldn’t It Be Great” and is the latest in Loretta’s “Cash Cabin Sessions”, which is a set of recordings made at the Cash Cabin Studio in Hendersonville, TN and produced by Johnny & June Cash’s son, John Carter Cash. The new album will include brand new songs as well as re-interpretations of some of her majesty’s classics. To read more and find a full track listing, click here!